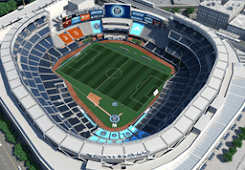 It's outstanding, to have NYCFC literally front and center at Yankee Stadium. This will give the club tons of exposure on both local and national television. Shame about that white keyline, though.